Product component defects or damages resulted from defective production is covered under warranty. Defects or damages with the following conditions will be fixed or replaced under SilverStone Technology’s jurisdiction. Usage in accordance with instructions provided in this manual, with no misuse, overuse, or other inappropriate actions*. Product is not modified or components replaced resulting in out of spec. operation. Under warranty, SilverStone Technology’s maximum liability is limited to the current market value for the product (depreciated value, excluding shipping, handling, and other fees). SilverStone Technology is not responsible for other damages or loss associated with the use of product. Under warranty, SilverStone Technology is obligated to repair or replace its defective products. Under no circumstances will SilverStone Technology be liable for damages in connection with the sale, purchase, or use including but not limited to loss of data, loss of business, loss of profits, loss of use of the product or incidental or consequential damage whether or not foreseeable and whether or not based on breach of warranty, contract or negligence, even if SilverStone Technology has been advised of the possibility of such damages. You must provide sales receipt or invoice with clear indication of purchase date to determine warranty eligibility. If a problem develops during the warranty period, please contact your retailer/reseller/SilverStone authorized distributors or SilverStone http://www.silverstonetek.com. Please note that: (i) You must provide proof of original purchase of the product by a dated itemized receipt; (ii) You shall bear the cost of shipping (or otherwise transporting) the product to SilverStone authorized distributors. SilverStone authorized distributors will bear the cost of shipping (or otherwise transporting) the product back to you after completing the warranty service; (iii) Before you send the product, you must be issued a Return Merchandise Authorization (“RMA”) number from SilverStone. Updated warranty information will be posted on SilverStone’s official website. Please visit http://www.silverstonetek.com. for the latest updates. A single PCIe 8pin cable and connector’s maximum current rating is 12.5A, which is 150W (+12V x 12.5A). So SilverStone’s warranty will not cover damages or malfunction resulting from the use of a graphics card or expansion card with a single PCIe 8pin connector that exceeds standard 225W total power draw (150W from PCIe 8pin connector + 75W from PCIe motherboard slot). Similarly, a graphics card or expansion card with dual PCIe 8pin connectors that exceed 375W total power draw (300W from two PCIe 8pin connectors + 75W from PCIe motherboard slot) will also not be covered under warranty. Peripheral (molex) or SATA connector’s maximum current rating is 5A, which is 60W (+12V x 5A) or 25W (+5V x 5A). Please ensure connected devices are operating under these limits. 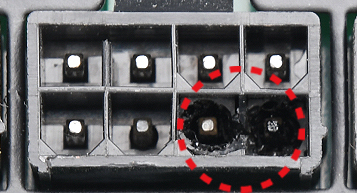 SilverStone’s warranty will not cover damages or malfunction resulting from usages exceeding these connectors and their associated cables. 24pin motherboard connector’s maximum current rating for its dual +12V metal pins are 5A each, which totals 120W (+12V x 5A x 2). Please ensure +12V drawing devices connected to the motherboard are operating under these limits. SilverStone’s warranty will not cover damages or malfunction resulting from usages exceeding these connectors and their associated cables. Please contact your local SilverStone authorized dealer or distributors for more information. Alternatively, please contact North America customer support. Please contact your local SilverStone authorized dealer or distributors for more information. Alternatively, please contact Europe customer support. Please contact your local SilverStone authorized dealer or distributors for more information. Alternatively, please contact Australia customer support. Please contact your local SilverStone authorized dealer or distributors for more information. Alternatively, please contact Hong Kong customer support. Please contact your local SilverStone authorized dealer or distributors for more information. Alternatively, please contact India customer support. Please contact your local SilverStone authorized dealer or distributors for more information. Alternatively, please contact Indonesia customer support. Please contact your local SilverStone authorized dealer or distributors for more information. Alternatively, please contact Korea customer support. Please contact your local SilverStone authorized dealer or distributors for more information. Alternatively, please contact Malaysia customer support. Please contact your local SilverStone authorized dealer or distributors for more information. Alternatively, please contact New Zealand customer support. Please contact your local SilverStone authorized dealer or distributors for more information. Alternatively, please contact Philippines customer support. Please contact your local SilverStone authorized dealer or distributors for more information. Alternatively, please contact Singapore customer support. Please contact your local SilverStone authorized dealer or distributors for more information. Alternatively, please contact Taiwan customer support. Please contact your local SilverStone authorized dealer or distributors for more information. Alternatively, please contact Thailand customer support. Please contact your local SilverStone authorized dealer or distributors for more information. Alternatively, please contact customer support.